Coco Nara charcoal is made with 100% coconut shell. Very good quality Coconut shell charcoal that can give you best hookah smoking experience. Coco Nara coconut shell charcoal is made using the finest coconut shells collected from islands in Indonesia. Very good quality coconut shell charcoal for hookah lovers, smoke shop owners or anybody carrying smoking accessories. 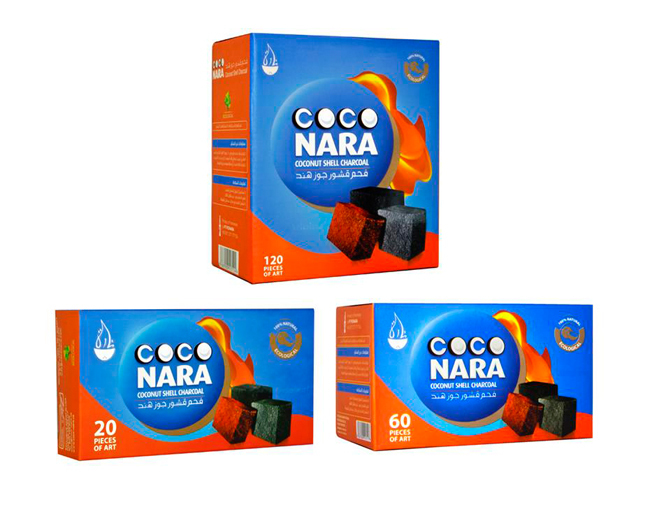 Coco Nara coconut shell charcoals can burn up to 60 minutes. These tasteless charcoals are easy to get ready for hookah. You can light up these coals by placing them on top of the stove or on electric oil burner. Within 5-10 minutes charcoal will be lighted in red color. These coconut shell charcoals are favorite among majority of hookah lovers throughout the world. It is recommended not to light up Coco Nara charcoal with any gasoline or lighter fluid. It will ruin the smell and taste of the charcoal resulting into unpleasant hookah smoking experience. Also, always consider to light up charcoal in well ventilated place to avoid any harm. Coco Nara coconut shell charcoals comes in different packaging, at VK Wholesale, we carry Coco Nara coconut shell charcoals 20 pieces of art, Coco Nara coconut shell charcoals 60 pieces of art, and Coco Nara coconut shell charcoals 120 pieces of art. Overall, Coco Nara coconut shell charcoal flat pieces are perfect for mind blowing hookah smoking experience. Checkout Coco Nara charcoal wholesale price to save money. This entry was posted in Smoking Accessories Wholesale, Wholesale Products and tagged c-store items in bulk, Smoking Accessories Wholesale, wholesale c-store items, wholesale convenience store items. Bookmark the permalink.